I left you all hanging, but knowing we were in a good place. 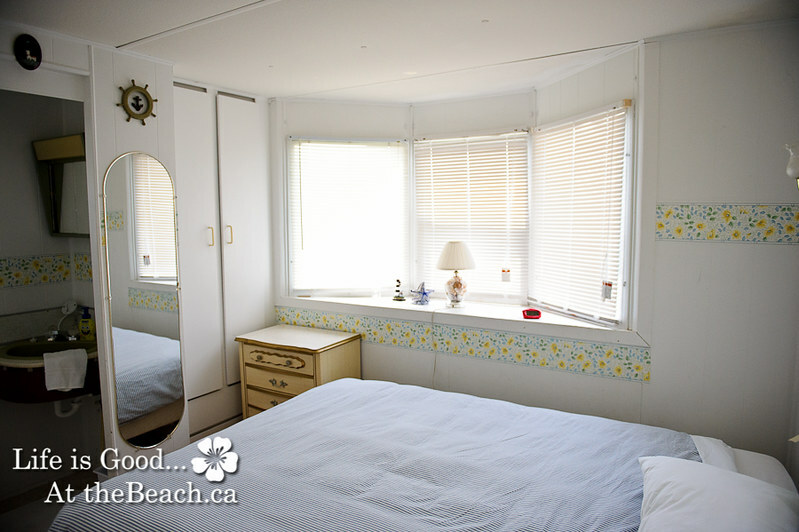 After a week of wondering if our little beach house was really ok, Hubby and I packed up and headed down to the beach. 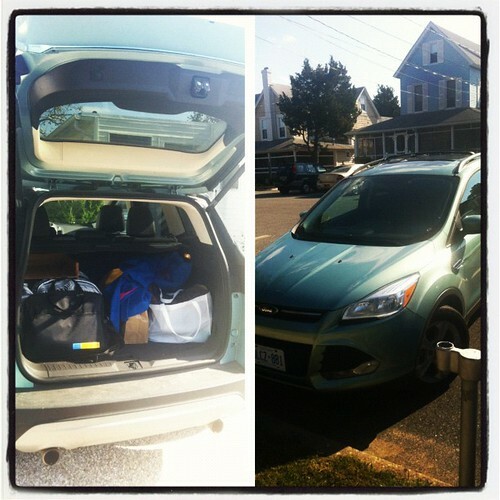 That week I was scheduled to try out a new Ford Escape. 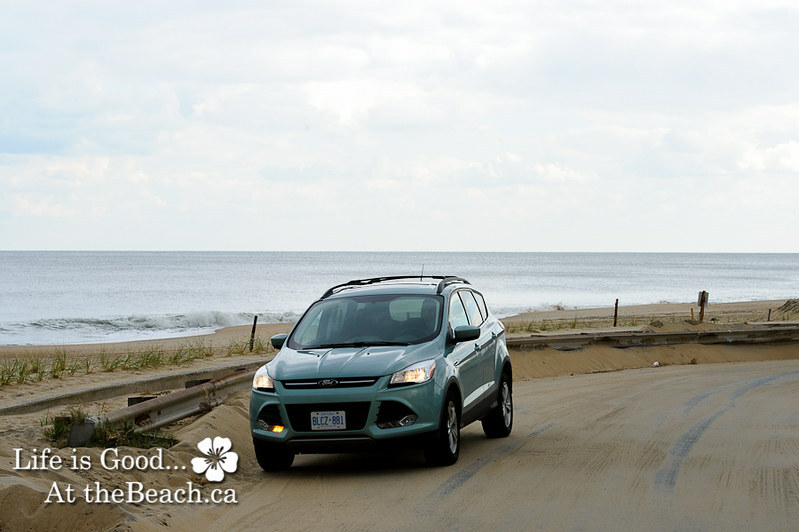 I was looking forward to trying out a car around town for once, but when we got word that the beach was no longer flooded and that the roads were clear, I asked if they wouldn’t mind me taking the Escape down to the beach. Usually my girlfriends are the ones who get to try out the Ford cars that I borrow but this time Hubby was a willing participant. On a regular day he drives a very small car and on a nice Summer’s day he rides the bike, we keep talking about switching up the smaller car as it isn’t the most comfy for 8.5 hours of driving even though both Hubby and I did it this Summer, but not with the kids in the back. The Escape was quite a treat. I am not going to lie, the Ford cars that they give us to test drive are fully LOADED! Something that I truly love because I do drive a vehicle that is fully loaded and although I may be a bit spoiled, when you drive as much as I do you appreciate the comforts that come with that. I am no longer in my twenties when driving a Chevette from Winnipeg to Ottawa was considered fun I am in my forties and appreciate all the extras that come with the luxuries. The single most important thing for me is seat comfort. And I noticed in the Flex in August and again in the Escape that the seats are so comfy that I can just sit molded into the drivers seat and drive. It takes a few minutes of adjusting but then I can lean my head back on the headrest and enjoy. I don’t get tired at all, which is why I was able to drive New York City – Ottawa- Delaware in one day last summer after driving the Flex. Add to that the fact that the Escape had heated seats and I was in heaven and it wasn’t just high and low, there were five (5) settings of amazing. After the seats, my next favorite part is the SYNC system by Microsoft. 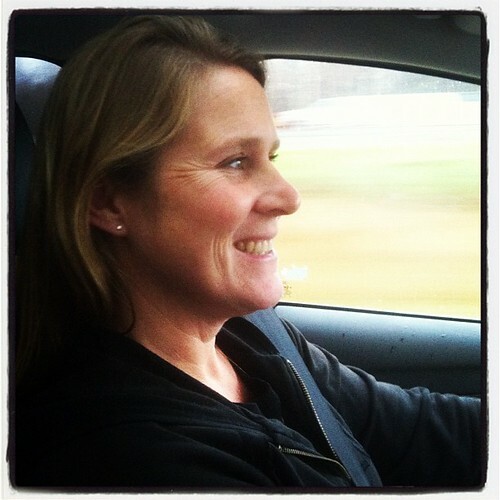 Hubby just could not figure it out, but since this is my fourth time riding in a car with SYNC I was doing pretty good. We had my phone hooked up to play music through Bluetooth, the Satellite stations were set up and we settled on some old ’80s tunes for fun. The maps were fully up-to-date and gave us gas stops and exact mileage (something not all GPS’s do) door to door. We loved the construction alerts that would pop up so we knew what was up ahead and why. I love it! I know there is a lot with the SYNC that I don’t know how to do, but if we owned one it would be a hotspot and we would make good use of all the tools, one week just isn’t enough time to fully figure that out. Last of all, LEG ROOM! I am all leg at 5’10” and Hubby is not too bad at 6′ once we get into the seats there is usually not much room to spare in the back seat for anyone but Apple since she is still in the carseat. J was able to sit comfortably (bear in mind they didn’t go to Delaware, but they did drive around the city with me a bit) and he loved the curve of the seat in the back, something he complains about a lot in our other vehicles. Hubby insists that I include the gas mileage. With the EcoBoost we should have been getting 6.3L/100km according to their handbook, but I think we weren’t driving 90km/hr the whole time, so we got 8.5L/100km which is about 4L better than the vehicle I drive now. The end result is that we spent $80 less on gas on the trip than we do normally. The Escape is a 4 cylinder and we drive a massive 6 with a high performance engine, but the only time you could tell the difference was when you were first starting from a stop position. 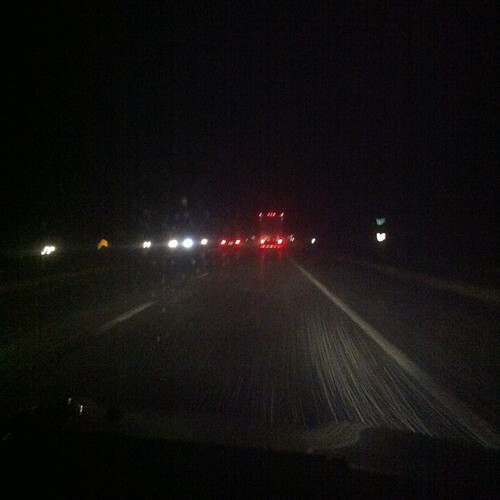 The Escape was just as quick on the highway when passing as our current vehicle but it used less gas. 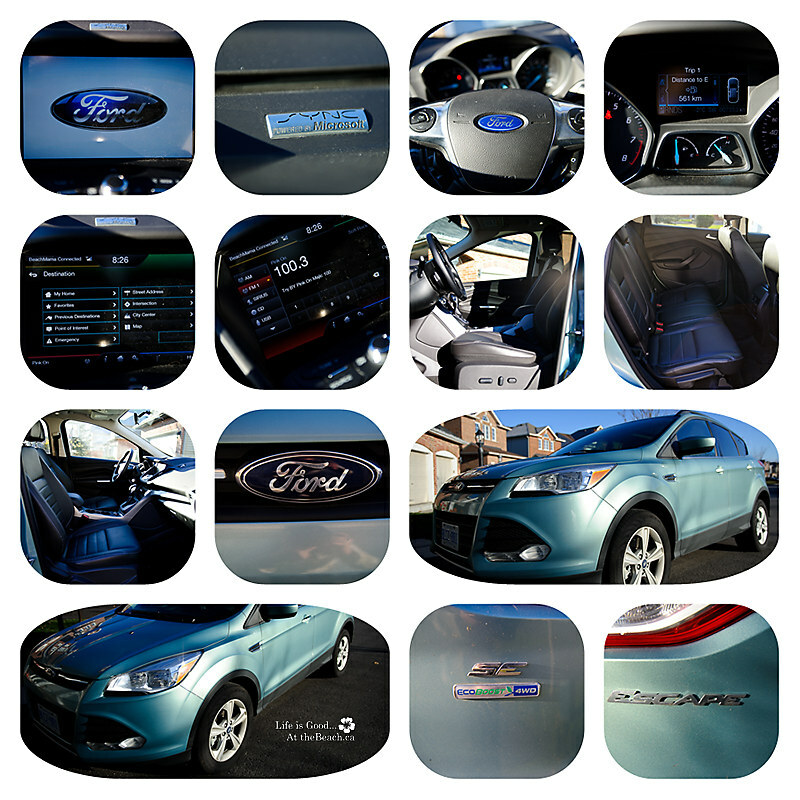 Hubby was quite impressed and now understood why I say yes whenever I am offered a Ford for a Road Trip. What did we find at the Beach? Well thanks to some misunderstood directions and amazing neighbours we had almost no damage to the beach house at all, we had one roof leak because our handy man had sealed the roof two weeks before and none of our chairs or tables floated away because our neighbours put them in the porch. Our flag was in the porch as well, so it wouldn’t blow away in the storm. We had some minor electrical problems that we had to fix while there, but that was something we were going to have to do by next summer anyway, and this way it was easier to do without the kids with us. All in all most of our time was spent raking and cleaning up debris on the lawn, then checking out neighboring towns and the main beach. There was an air of quiet jubilation since we were supposed to get a direct hit, but the storm moved a few hours before landfall and hit further up the coast. Everyone was thankful, but also thoughtful of others that weren’t as fortunate. You take a chance when you live on the ocean, not something we have taken for granted in the past having been in a few Hurricanes and Tropical Storms, but this was the first time we had to worry about our own property and if it would have been floating out in The Bay. We feel very Blessed to have met so many amazing people at the Beach and knowing they were looking out for us Canadians from afar was quite touching. We received phone calls and notes and feel like part of the community after only one summer. We just returned from celebrating Thanksgiving as we felt it was most appropriate to be there this year as we have so much to be Thankful for. 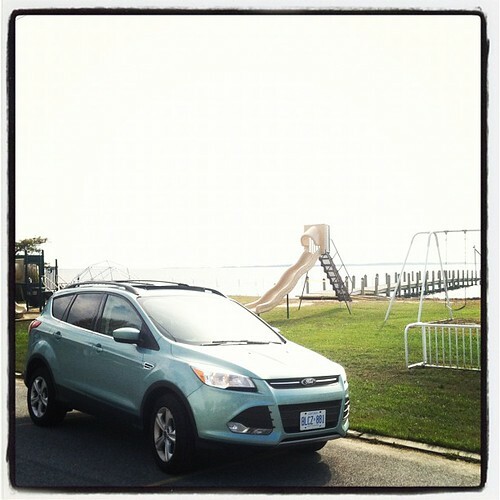 A HUGE Thank you to Ford Canada and Kristine at Thornley Fallis for making our post Sandy trip a little more fun and exciting with the Escape. Here is one of my fave pictures of the Escape. 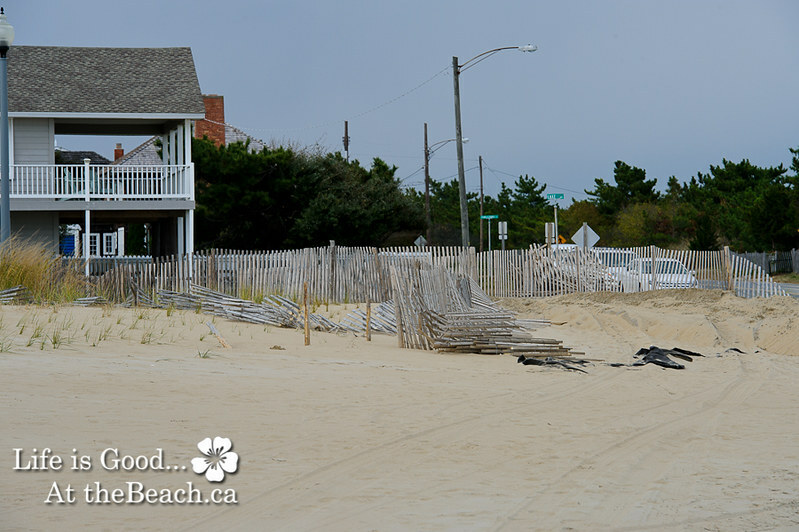 This is Surf Avenue at the north end of the Boardwalk, CNN was reporting from this spot several times as this is one of the areas where the waves breached the dunes and as you can see, the sand on the road had just been plowed, only three days before we took this picture the road had been flooded out. This is looking at the same spot from the beach side. The photo above, the Escape was parked on the right side of this photo just where I cut the picture off (we weren’t parked there when I took this photo as there is no parking, but that is where we stopped to get the shot). The gentleman in the house with the porch wouldn’t evacuate as he is in his 70’s and his wife couldn’t travel well. They made out just fine. 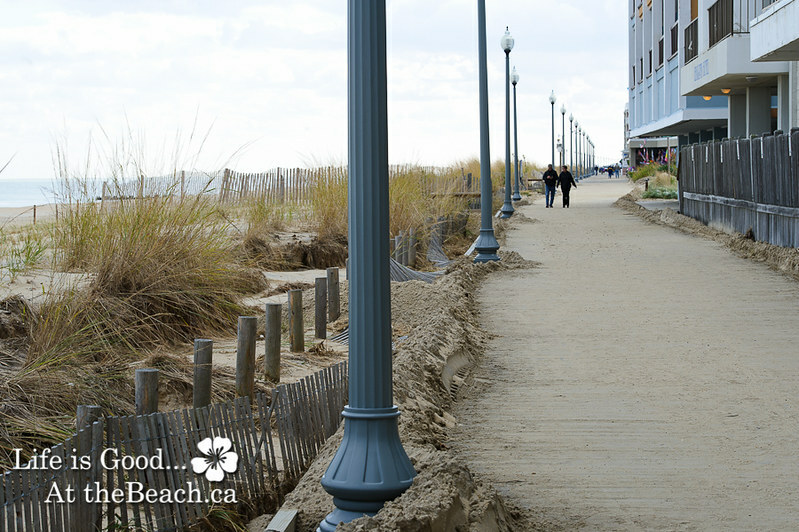 The boardwalk got a lot of sand, but the dunes and the new beach did it’s work and the breaches only happened at walkways like at this one, they pushed all the sand to the side so people could walk, and brought the benches back out so we could sit and survey. It was strange to see the rocks up on the beach, but they came up the walkways as well. The beach was still wide, which is a blessing since the replenishment only happened last summer, the one good thing is that the Jetty’s were once again visible, they were buried in the replenishment last year and it was a little disconcerting to be allowed to swim everywhere but to not know exactly if you were standing on a jetty that could reappear at any time. Here’s hoping they get to stay! If you would like to look at more photos of the beach, I have a flickr set with more here. Some images I tweeted out @Beach_Mama. I got to drive!!! The Escape in Rehoboth Bay, which was under water three days before we got there, The Escape packed for the ride home and one last stop at the Boardwalk, Driving through some snow on the way home. I could tell you all that I have been up to since August, but truth be told, this is my busiest time of year with my Photography Business and silly me, added another business to the round up, so double that and you will know where I am. Spinning out of control. I promised myself I would blog on my birthday, but I had to work, for the first time ever on my birthday so instead I am blogging tonight, almost a week later. I haven’t forgotten about my blog as some of you may think, I have been told that people have given up on me. That is Ok because if you know me well you know where to find me: Photography Blog, Twitter, Instagram, email and we would still be in touch. I haven’t dropped off the face of the earth, I have just been working hard. Since August, I have had Apple start school full time, started my Arbonne Business, Ballet, been to Delaware three more times (and another trip coming up), Birthday parties for J and Apple and Fall Family Sessions along with Photographing conferences, Photo walks and actually meeting people in person instead of online. Phew. 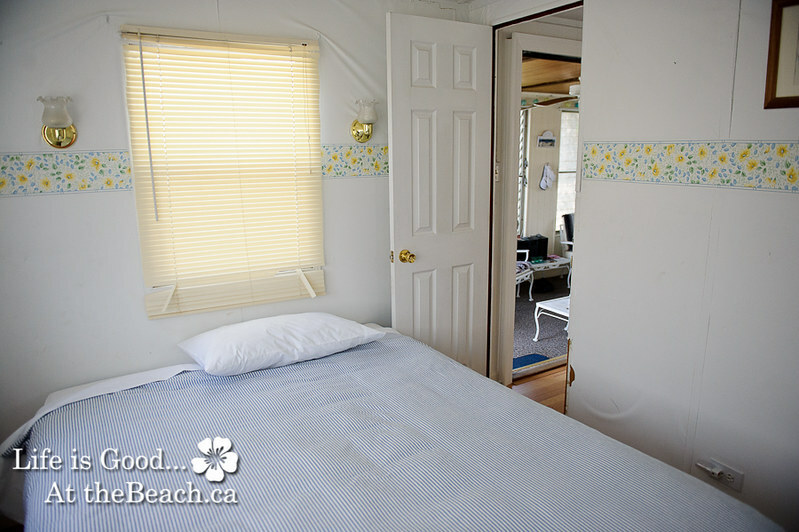 All this talk of Hurricane made me remember that I never shared the after photos of the Beach House. 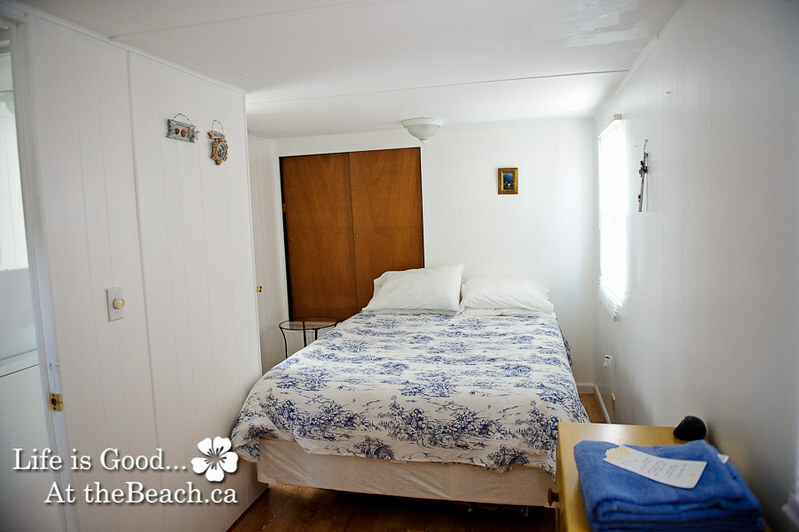 The very Beach House that had us praying for its safety. 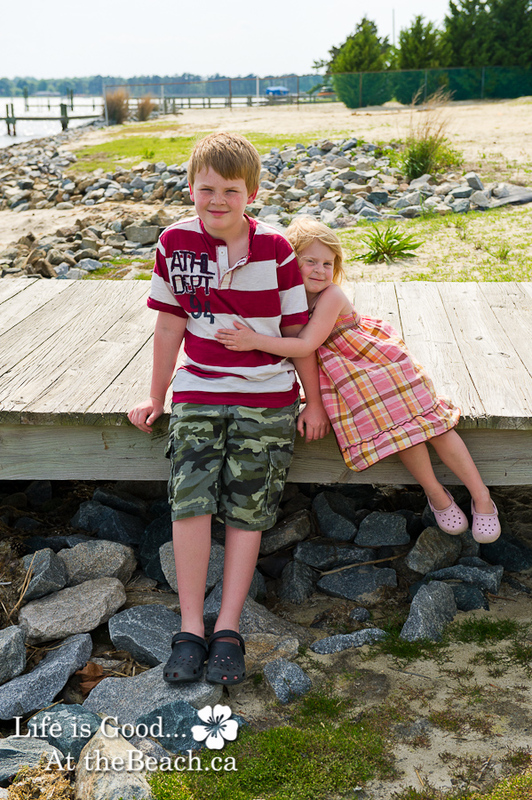 You see, our little dream is located on a flood plane on Rehoboth Bay in Delaware. We are mere steps from The Bay, which empties out into the ocean. When we stand on the crabbing pier we look out to the Indian Inlet Bridge that was closed Sunday due to flooding. So you can imagine what we did for Saturday, Sunday and Monday. 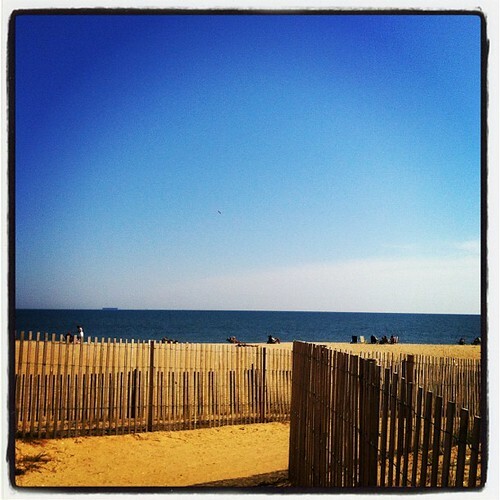 We trolled the internet for any signs that our Beach House was not floating away into Rehoboth Bay. 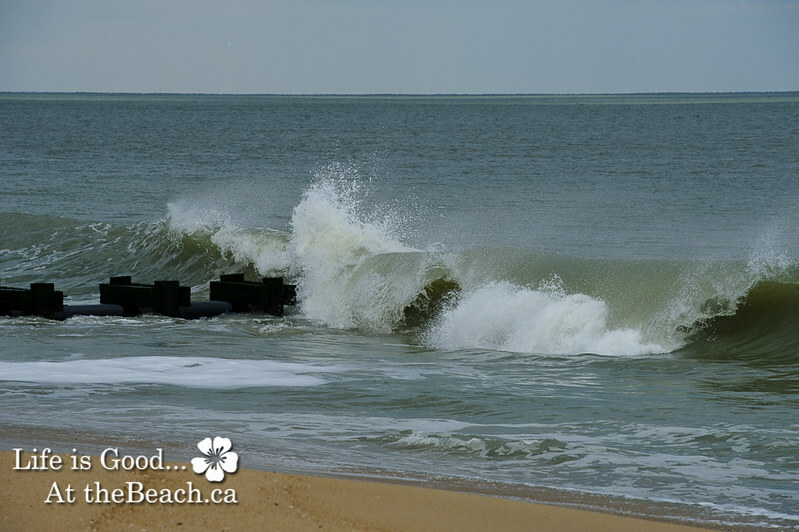 As Rehoboth Beach (which includes us) was evacuated on Saturday we knew we lost any hope of contact with our neighbours, some of which live there year round. 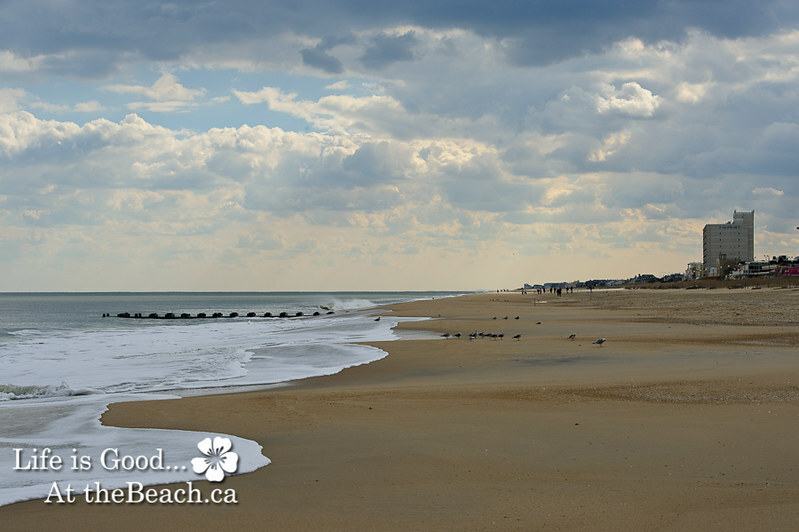 Our handyman Rich and his wife, not only have a home in Rehoboth but also in Chincoteague Island, Virginia. 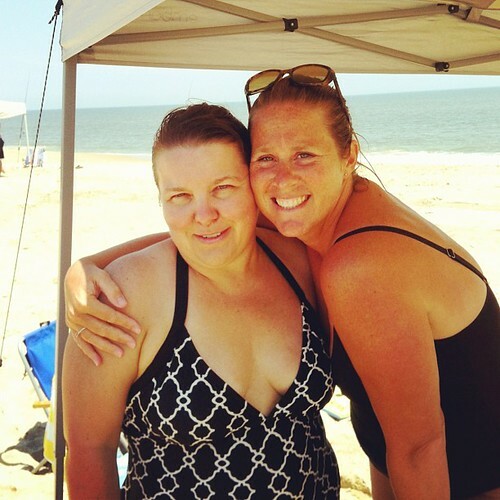 We prayed for their safety and are happy that at least their home in Rehoboth was spared, not so sure about Chincoteague but we will find out soon. Our Beach House was indeed spared. With talks of flooding in The Bay, and the main road into our community we thought for sure the water would be up to the doorway or worse. We had no illusions of grandure, we expected to find out that we had to start from scratch. We were prepared for the worst. When Hubby called the office today after we heard the driving ban was lifted, he was surprised to talk to the ladies in the office, laughing and telling him that it was a miracle that there was no flooding to our houses. The water did come up our street a little but nothing more than a regular summer storm would bring. Miracles to happen and although I am saddened by the news for others in other States like New York and New Jersey, I can’t help but be thankful that we were spared. We will make the trek this weekend to check that the roof didn’t leak and that there isn’t anything to be taken care of that can’t wait for Thanksgiving. Yes, we will return later in the month for Thanksgiving (unless there is lots of snow up here) as we have so much to be Thankful for this year. 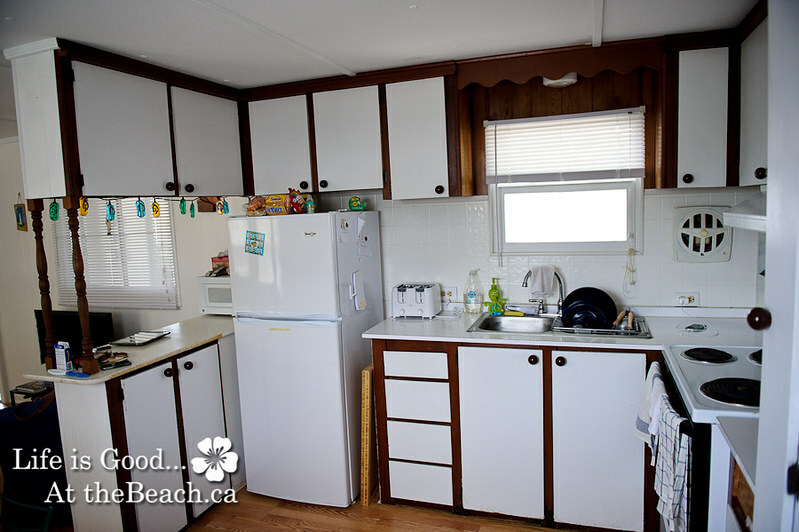 Here is a little peek into our Beach House, post renos. And honestly all we did this year was replace the floor (which included patching holes), wash the walls and bring in new beds and a couch. Next year we are going to update the bathrooms (which are 1969 old), paint and possibly add an outside shower. After spending three weeks here in June and July it was amazing what you can live without. We had very little with us, a few toys, an xbox (for games and movies) and our computers. 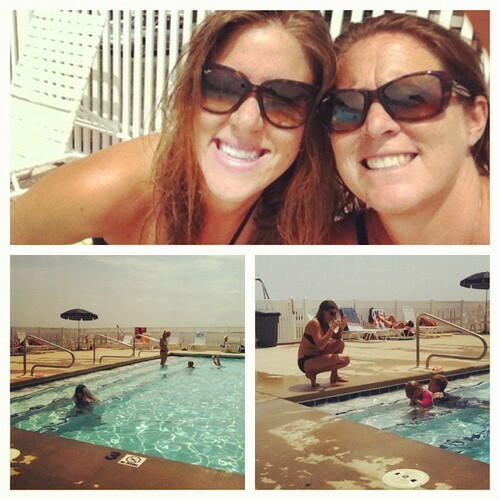 We spent mornings on the beach and afternoons by the pool. 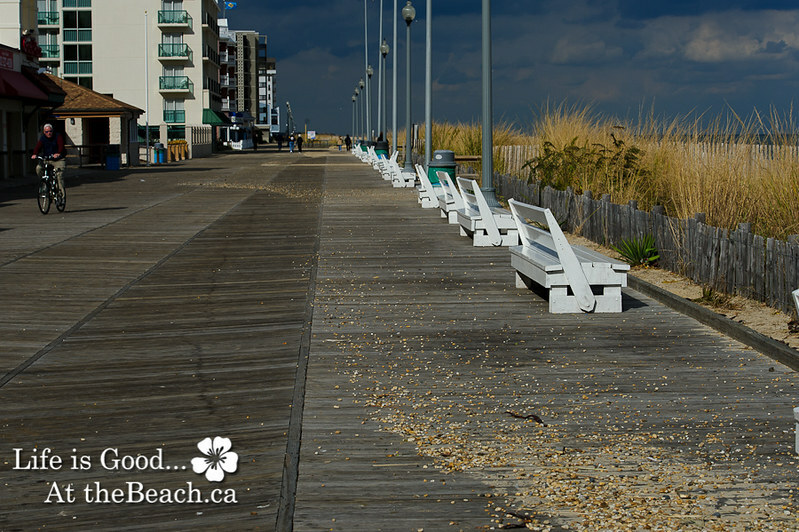 We alternated nights with staying home and going to the boardwalk. 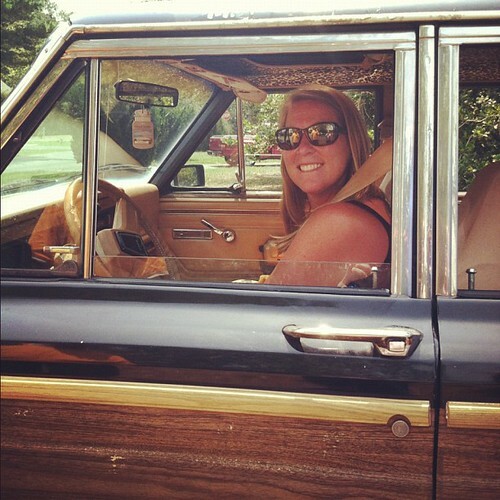 My cousin even lent me her 1989 Jeep Wagoneer so I could stay longer with J and Apple and she hadn’t even driven it yet! 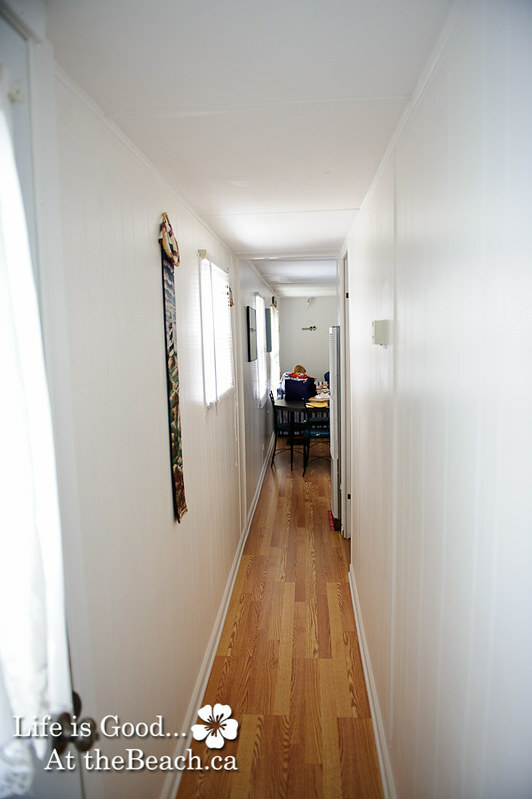 Our Living Room (with lunch to head home already packed on the table) and the hallway leading from the backdoor to the living room. 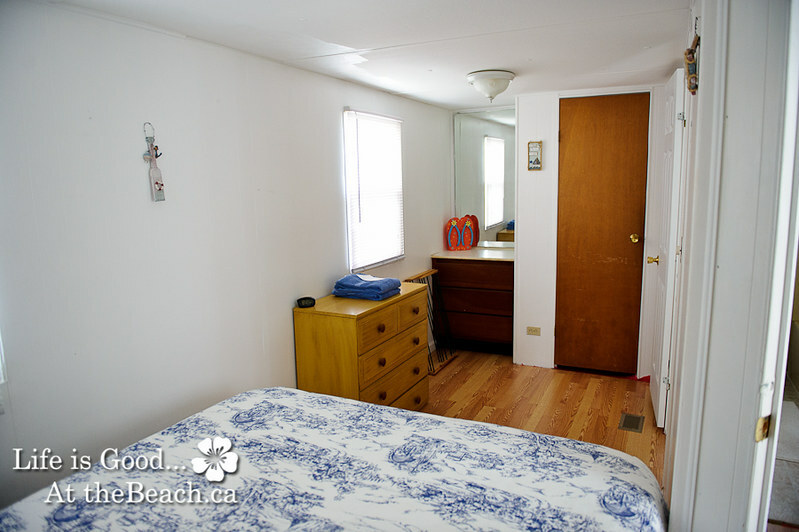 And the Master Bedroom, complete with ensuite/full bathroom. 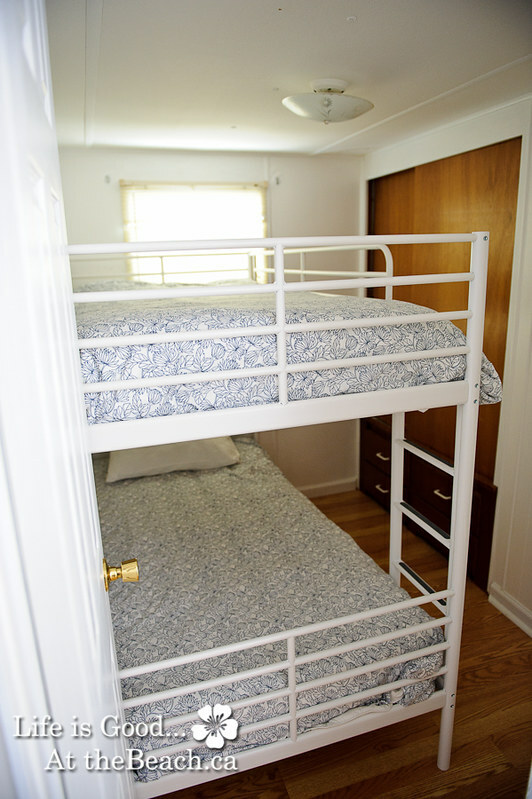 We chose to go with Queen beds in the main bedroom and front bedroom so that we could sleep comfortably, it means that there isn’t a lot of room to walk around the beds, but they do move easily on the floor and it makes for a much more comfy sleep in the heat… trust me on that one. And that is a little tour of the Beach House. Hubby and I will head down to check it out later this week, while the kids stay home and go to school. 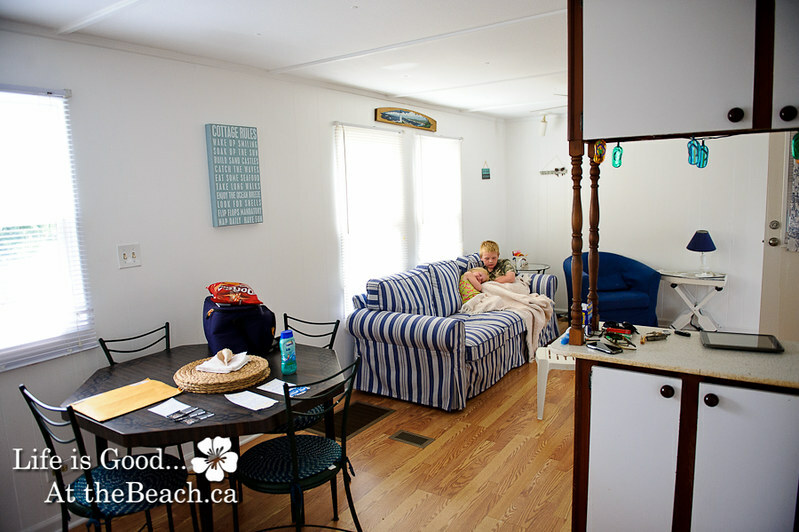 We were thrilled to be at the Beach House for Canadian Thanksgiving, where we cooked a turkey and had our family over for supper, we were tight, but we managed with eight of us watching a football game and enjoying Canadian turkey. 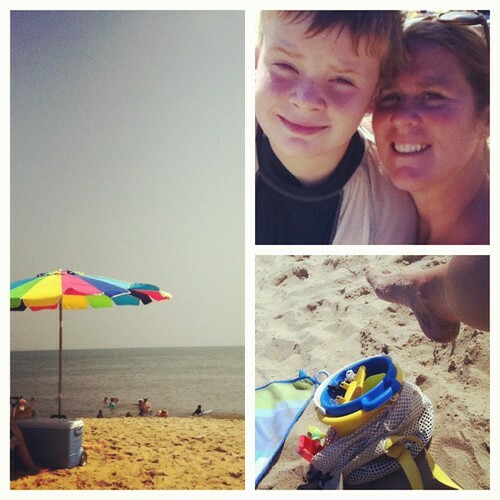 We also had two amazing days on the beach before the weather turned cold. A little last fling of summer for sure. Now that I am missing Summer terribly, I will try hard not to wait as long between posts. I may even post from the beach again this weekend, we shall see. Until the next time.